DETROIT -- Center Brad Richards has looked at the Detroit Red Wings with respect from afar. Richard signed a one-year free agent contract July 1 which guarantees $3 million in salary and could reach $4 million with performance bonuses. "I've obviously admired this team for a long time and no different the last few years," Richards said Thursday at Joe Louis Arena after skating with his teammates for the first time. "Even though they hadn't made a long run (in the playoffs), they're right there, so that's always an impression. I'm very excited to be a Red Wing and play with some of these great players." 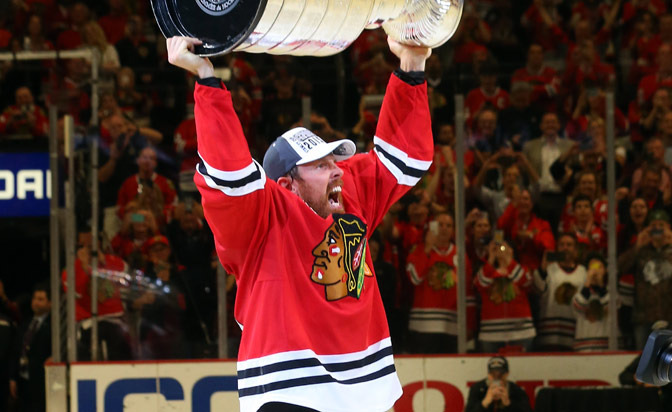 Richards, 35, helped the Chicago Blackhawks win the Stanley Cup last season. He had 12 goals and 37 points in 76 games and three goals and 14 points in 23 playoff games. He also won the Stanley Cup with the Tampa Bay Lightning in 2004, when he had a League-leading 26 points in 23 games and won the Conn Smythe Trophy. Richards has 288 goals and 904 points in 1,058 games in a 15-season NHL career; he also played for the Dallas Stars and New York Rangers. Richards would be projected as Detroit's No. 2 center, but with Pavel Datsyuk's availability in question after ankle surgery on June 26, Red Wings general manager Ken Holland said the plan is for Richards to start the season as the No. 1 center. "Obviously I know what I'm brought here to do and what I want to do and now it's up to me to go and do it," Richards said. "I just came in [Thursday] with a friend and family will come in next week. I wanted to get a skate in. I haven't skated this week, just packing the house. It's good to get a sweat and meet some of the guys. It'll make tomorrow a little easier." Chicago defeated the Tampa Bay Lightning in the Stanley Cup Final last season. The Red Wings lost their Eastern Conference First Round series to the Lightning in seven games. "I just played a team that they had on the ropes in the Finals," Richards said. "This league's so tough, so crazy, bounces here, momentum here. Watching that series from afar, everybody kind of thought Detroit had them … kind of thought the Wings were going to close that series out. They didn't; that shows you how close it is. I don't see why [Detroit] can't compete. It's a young team that has a little more experience again. That's always valuable."